At The Law Offices of P. Kent Eichelzer III in Woodstock, Georgia, we provide the exceptional advocacy and support you need to help you obtain the maximum amount of compensation you deserve for the injuries and losses you sustained as the result of someone else's negligence or wrongdoing. Serving clients throughout Cherokee County and the surrounding areas of the Atlanta metro region, we possess more than 18 years of experience fighting on behalf of those in need, and our law firm has become one of the leading personal injury practices in the region. Over the course of our history, we have recovered millions of dollars in settlements and awards for our plaintiff clients adversely affected by car and truck accidents, medical malpractice, insurance bad faith disputes, defective products, wrongful death, and other similar matters. Our most notable successes include a landmark verdict of $15 million for the victim of a drunk driving accident. While we cannot guarantee a specific result regarding your case, we can promise to do whatever we can to help you achieve the most favorable outcome possible so that you can pay your bills, cover your lost wages, and support yourself and your family. 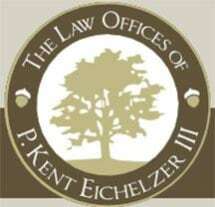 With an additional office in Marietta, Georgia, The Law Offices of P. Kent Eichelzer III offers convenient access to the high level of representation you need. To find out more, you can call our office or visit our website to schedule a free initial consultation.